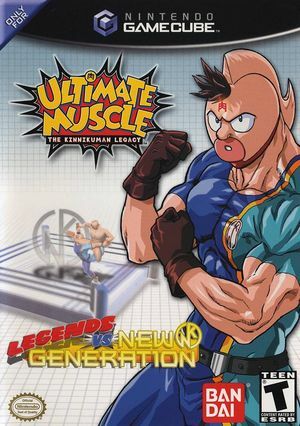 Ultimate Muscle: Legends vs. New Generation (aka Kinnikuman Nisei: Shinsedai Choujin vs. Densetsu Choujin in Japan) is a wrestling game based on the anime and manga, Ultimate Muscle. As evil villains return to take over the world, a battle ensues between old and new superheroes. The wise trainer of both generations, Meat, has decided to pit the two generations against each other to decide which generation is the strongest of all time. In this epic battle, you can play as 20 different characters, each with different wrestling skills and signature finishing moves. Customize your character and play in Story mode or Versus and Tournament mode against three of your friends. The graph below charts the compatibility with Ultimate Muscle: Legends vs. New Generation since Dolphin's 2.0 release, listing revisions only where a compatibility change occurred. 4.0 Windows 8.1 Intel Core i3-3245 @ 3.4GHz NVIDIA GeForce GTX 660 constant crashes during gameplay. This page was last edited on 25 July 2018, at 03:36.